This rig, uses brush less (BLDC) motors. The positioning system behaves like a servo motor. I use the internal hall sensors of the BLDC motors to count steps. So there's no pot for positioning. This was the idea from the start, but since I just had an Arduino, there was no speed to calculate steps, and made a pot version. You are going to find the two versions on this thread, but in my opinion, the use of the internal hall sensor is way better, cheaper and more durable. First time posting, but sneaking for a long long time (sorry for some English errors I might post). So some of the guys here are guilty! Yes, I started to build a 6DOF motion simulator with DIY actuators. SeatTimes, SilentChill and some others, you are an inspiration. So, for some years I've been looking at motion sims, but since my desire was always cars and air planes, I always thought that less than 6DOF would kill the aircraft experience (probably I'm wrong). But now with so many 6DOF builds, specially with actuators, I though it's the time to start my build. Well it already started some months ago, but free time is always a problem. I will make some posts to put at the start of this thread the current project development. So let's start! Hope my project can help others. And let's hope I can make it. Arduino replaced by ESP32 and no more potentiometers. Positioning made with internal hall sensors of BLDC motor. Specs: 3 power pins up to 40A and 10 signal pins up to 5A. -The hexapod, no chair or wheel support. I spent more with errors I made and building a pot version of the actuators. Parts are from Farnell, Motedis and ebay. You can see the list in a post above. Motor is slower, but cost would come down to 2636,58€. Those files are made for my printer. They work for me and they have the right tolerances to fit the aluminium profiles and parts I use. They might not work for you. So use them at your own risk. They are printed in solid PETG. I think they are strong enough, although due to personal problems I still have to finish my rig to test them with the final load. So I don't know if they hold or how long they will hold. Also, this is continuously in development and I still might change the design. -Calculates lengths of 6DOF/Stewart/Hexapod arms for a specific pose. This software is also compatible with other hardware by using serial output similar to Simtools. This code should be compiled by the ESP tool 2.3.1. Seems that later versions have some problems (board keeps rebooting)). I think this is solved right now. Added a delay(1) in the second core loop to avoid a problem with the ESP32 interrupts. I'm now able to build with the latest version of the ESP tool. -Removed dead zone, no noticeable benefit. One less if. -Removed counts when searching for maximum minimum, no noticeable benefit since the analogue read repeats solves this problem. -Uses two functions for speed reasons, this avoids more if's. One gets position cropped and the other one not cropped. //  Removed dead zone, no noticeable benefit. One less if. //  Removed counts when searching for maximum minimum, no noticeable benefit since the analogue read repeats solves this problem. //  Uses two functions for speed reasons, this avoids more if's. One gets position cropped and the other one not cropped. Still using a similar solution to the pot positioning to detect minimum and maximum switches. So if minimum is pressed we get 0 in the ESP32. If maximum is pressed we get 4095 on the ESP32. None pressed we get around 2047. Now positioning is calculated from reading the hall sensors state. Lower resolution than the pot, but I think it's enough. For 6 actuators we need two ESP32 boards. They are connected the same way. I moved to the internal hall positioning solution, so this is no longer updated, but here for reference. 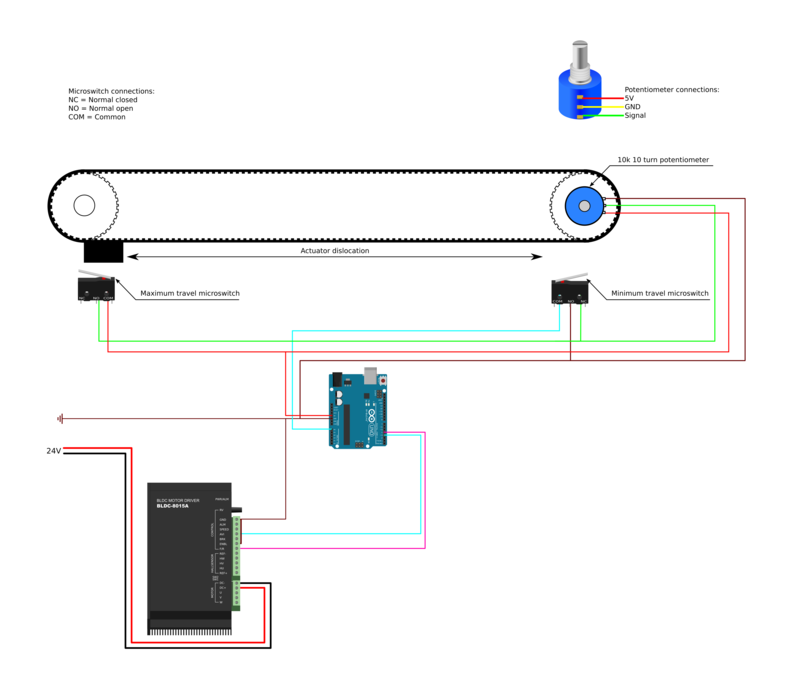 The idea is to control all the actuators with one Arduino Uno. I get position feedback with pots and two limit switches. When the maximum switch is pressed, the pot value is immediately 1023 on the Arduino. While no limit switch is activated, we get the value from the pot. The motor controller needs speed and direction information. Speed is fed with PWM and direction is on/off. I already have two actuators made. Built the first one as a prototype, looking for design problems. Please ignore that bad print, it was already replaced. Aluminium tube is hold tight by two screws, one in each side of the PETG "slider". 3: Top end actuator plate. Solder wires, pass them between aluminium profile and motor mount. Updated list of parts, software and added a video on the posts at the start of this thread. 5: Make cables that connect to the control box. In my idea, I want to build a box with all the power supply and controllers. When we have kids, just the actuator is already pretty dangerous, so electrics should be really safe and hidden, at least for cosmetic reasons. So, since I could not get the needed cables, I made my owns. This holds the pot and the UJoint. Must be strong! They make a sandwich to hold the pot. This one with the belt already in place. Some updates to the Arduino code. Updated the post about software in the start of the thread with the new code. Pretty impressive. You made your own code for the uno. Pretty cool. I was trying to avoid that by using rc components. Much better solution. How do you handle the pid tuning? I've seen some arduino code for self tuning pid but don't have the skills to paste that into an existing sketch. Glad someone got brushless working. PID tuning is manual, we can change the values in the array for each motor. Really curious about that code with self tuning. Can you give me a link? I'm still having vibrations in stand still, around 10º rotation off the motor to each side. Found the Arduino library for PID control and tuning, will have a look. But it must be fast for 6 motors. I still have to tune mine manually. Nice , What sort of load can they lift? It would be better to have the pot axe free from stress ..
Beautiful craftsmanship.. I like the 3 d printed parts on aluminum profiles together. Are the plastic parts solid density? Do you use special filament? What is the actuator max speed ?